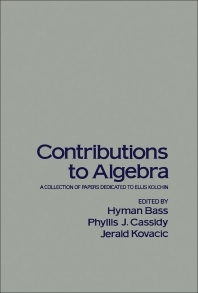 Contributions to Algebra: A Collection of Papers Dedicated to Ellis Kolchin provides information pertinent to commutative algebra, linear algebraic group theory, and differential algebra. This book covers a variety of topics, including complex analysis, logic, K-theory, stochastic matrices, and differential geometry. Organized into 29 chapters, this book begins with an overview of the influence that Ellis Kolchin's work on the Galois theory of differential fields has had on the development of differential equations. This text then discusses the background model theoretic work in differential algebra and discusses the notion of model completions. Other chapters consider some properties of differential closures and some immediate consequences and include extensive notes with proofs. This book discusses as well the problems in finite group theory in finding the complex finite projective groups of a given degree. The final chapter deals with the finite forms of quasi-simple algebraic groups. This book is a valuable resource for students.